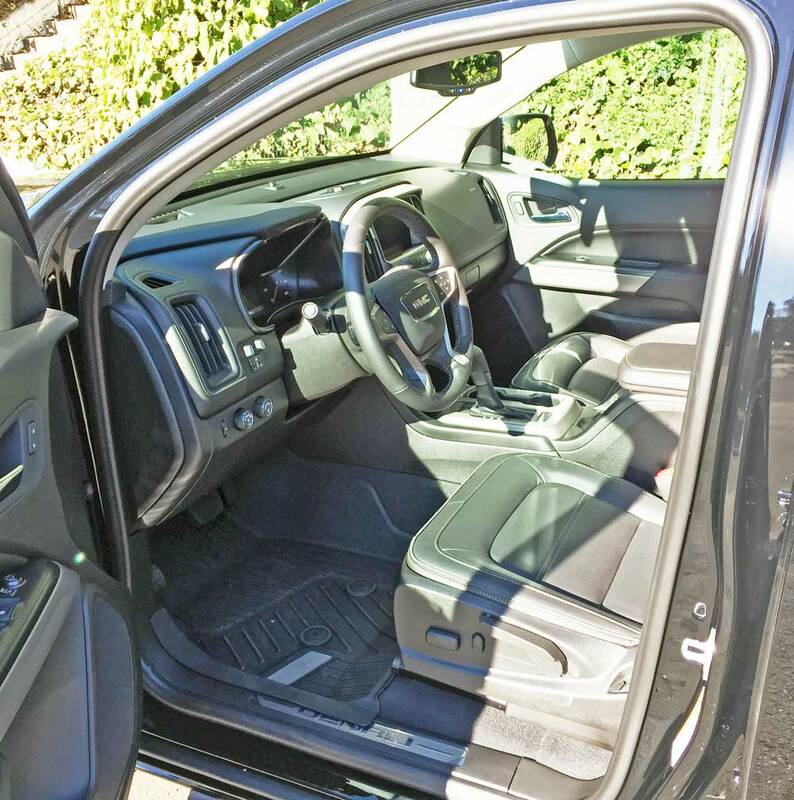 The 2019 GMC Canyon Crew Cab Denali is an ideally sized (mid) pickup truck that seats five comfortably and comes across as being larger than it really is. Key new features include: Rear Park Assist; Leather-appointed, heated & ventilated front seats; 5″ chrome assist steps; a spray-on bedliner with Denali logo; 20″ Ultra-Bright machined aluminum wheels; a Wireless Charging Pad; and a 3.6L V-6 engine with active fuel management. 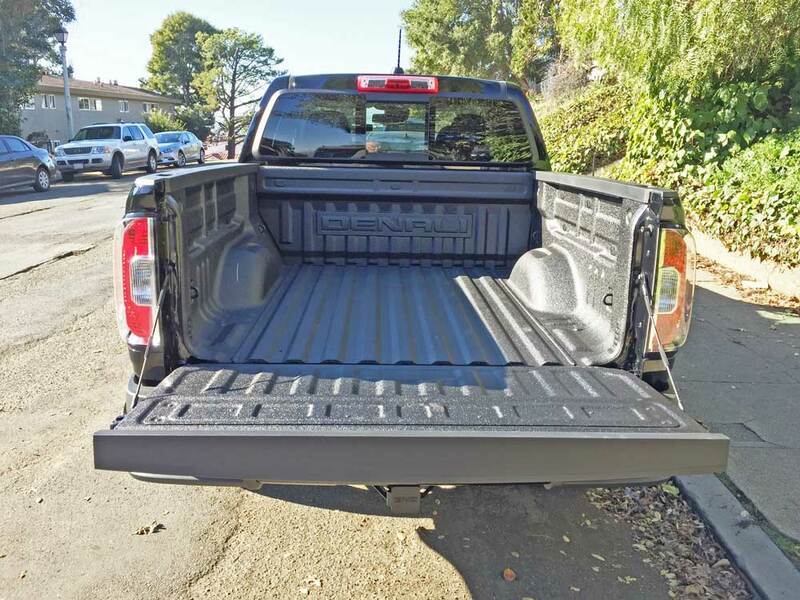 The GMC Canyon mid-size pickups come with a variety of choices: two body styles or cab configurations are available: an Extended Cab; or a Crew Cab, and there are also two box or bed lengths available: a 5’2” box for the Crew Cab; or a 6’2” box for both the Extended and Crew Cab models. 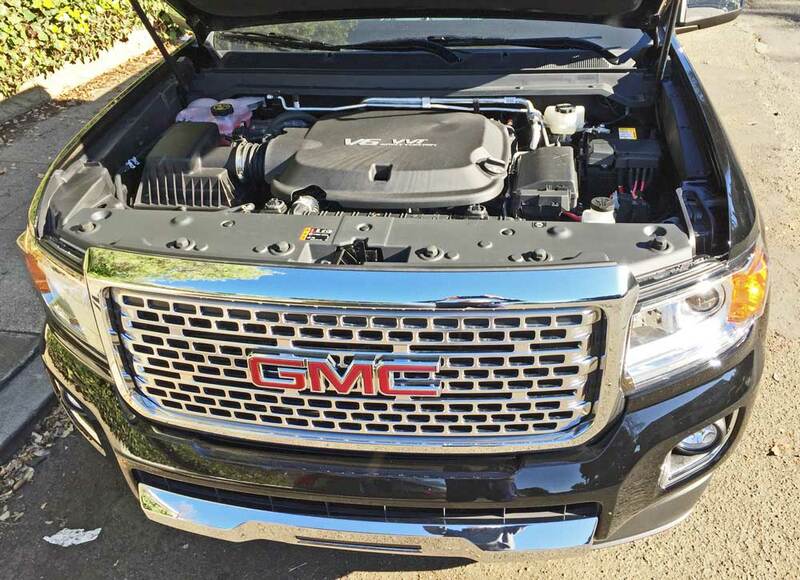 Two engines are available to provide power for the GMC Canyon: a 2.5-liter DOHC, 16-valve inline four-cylinder that generates 200 horsepower at 6,300 rpm while also developing 191 lb.-ft. of torque at 4,400 rpm; or a 3.6-liter DOHC, 24-valve V6 with VVT and Direct Injection that cranks out 305 horses at 6,800 rpm along with 269 lb.-ft. of torque at 4,000 rpm. A 2.8-liter Duramax diesel is also available. One may choose from two transmissions: a six-speed manual is available on select Extended Cab models; or an eight-speed automatic – available for Extended Cab units and standard for all other models. 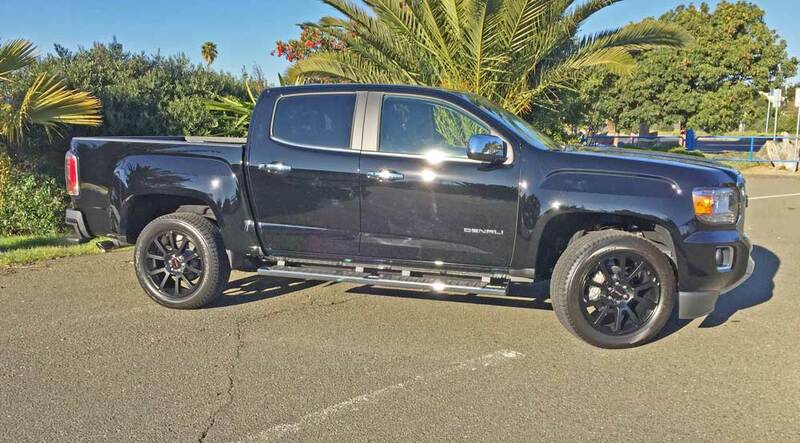 Trim levels for the GMC Canyon consist of the following grades: SL, SLT, All Terrain, All Terrain X and Denali. All models will be available in either a two-wheel drive (2WD) or four-wheel drive (4WD) configuration. In terms of its visual appeal, featured are heavy, masculine grille treatments, headlight styling, and minor hood and fascia differences from the Chevy line. Wheel styles are also varied. 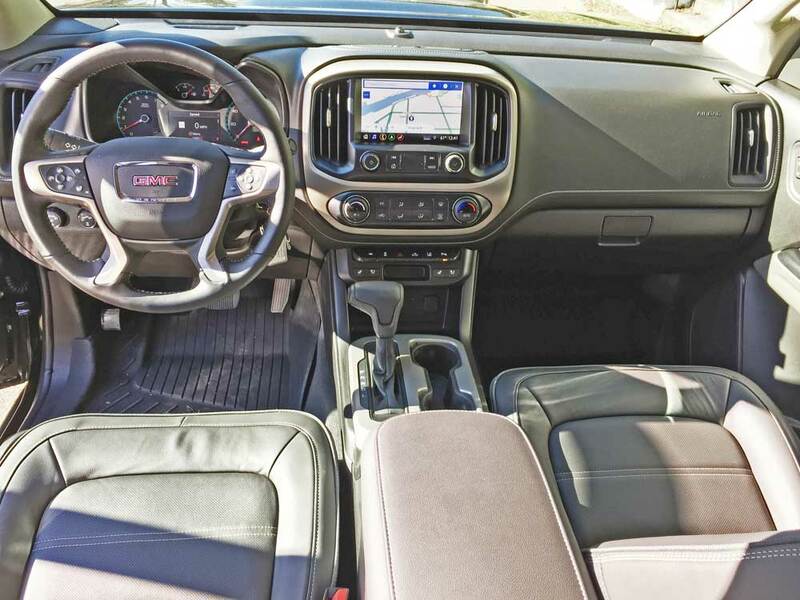 The GMC Canyon displays a confident and sporty stance with tall bedsides for greater payloads, and the Crew Cab exhibits an upward raked belt line. Proportions are balanced from virtually every viewing angle. 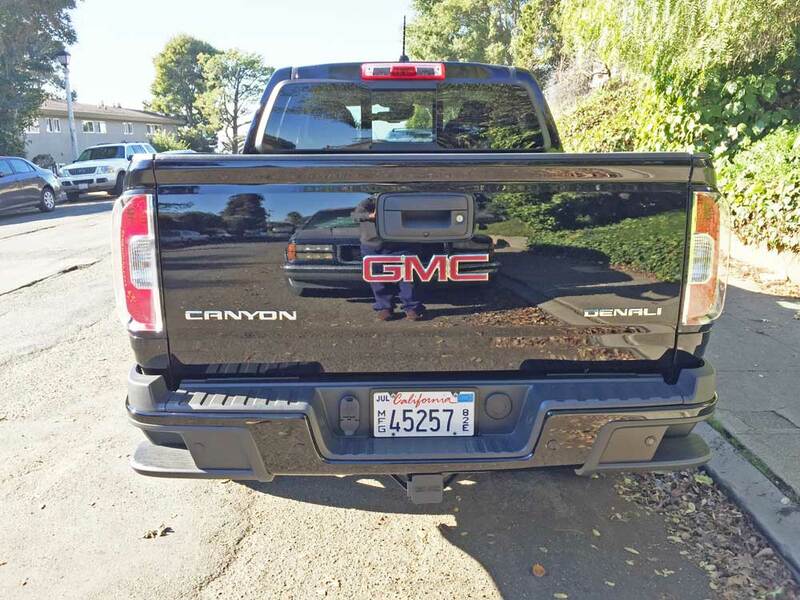 Several innovative solutions are provided for cargo hauling and access in the GMC Canyon models such as: a standard CornerStep rear bumper design; an EZ Lift-and-Lower and locking tailgate; standard two-tier loading for more convenient hauling, storage and concealment of valuables such as tools. There are thirteen standard tie-down locations throughout the bed utilizing available, movable cargo tie-down rings; bed rail and tailgate protectors are standard; and a factory-installed spray-in bed liner is available. The interior delivers a “Professional Grade” atmosphere to fulfill on the job duties, or at play in everyday comfort. The cabin of the Canyon has been thoughtfully designed to deliver not only comfortable surroundings, but comes well equipped and provides modern connectivity features. The instrument panel is bold and upright, with large controls and a center console with a floor-mounted shifter similar to those found in midsize cars and crossovers. There’s a sculpted headliner that enhances headroom, halo lighting on key controls for easier view and an open area at the front of the center console for easier phone charging. 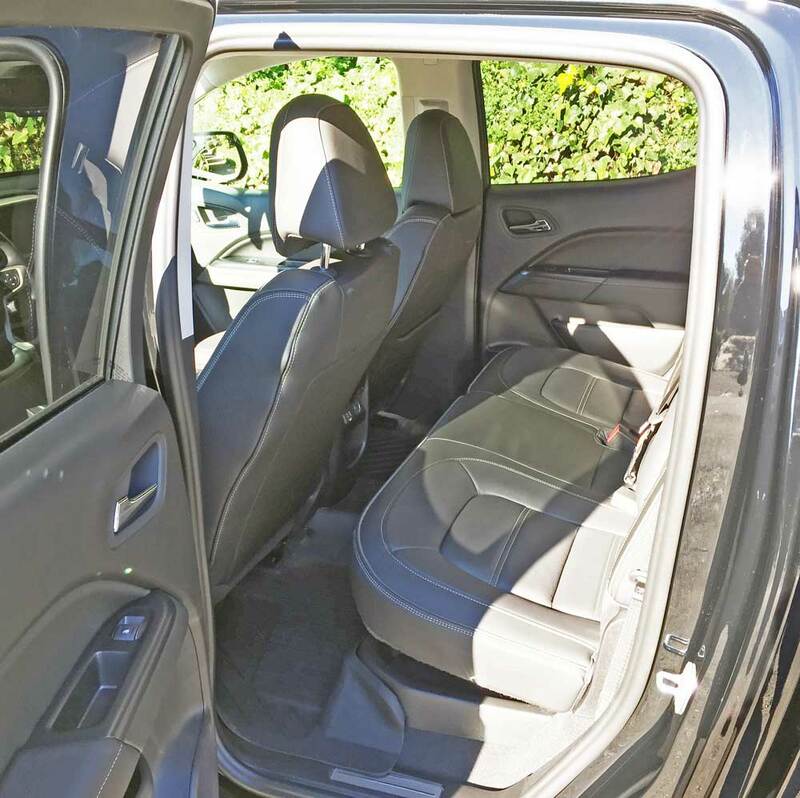 Other Impressive interior features include: an upper-instrument panel storage bin – when not equipped with the up level audio system – and a large volume glove box; a standard center console with room for tablet storage; a door-to-door rear under-seat storage is provided for additional concealed cabin cargo management. The Canyon’s seats utilize dual-firmness foam for greater comfort on long drives and high-wear, stain-resistant cloth seating trim, with leather-appointed seating available. Connectivity is provided by GM’s Intellilink and OnStar 4G LTE as standard on upscale Canyon models, with text message support and Siri Eyes Free. My test GMC Canyon was the Crew Cab version in Denali trim and a 4WD configuration with the short bed. Power was provided by the 3.6-liter V-6 with the eight-speed automatic gearbox. The midsize hauler sported an Onyx Black exterior finish with a Jet Black interior. The base sticker read $43,8000, which came to $48,.025 after factoring in the options and destination charge. 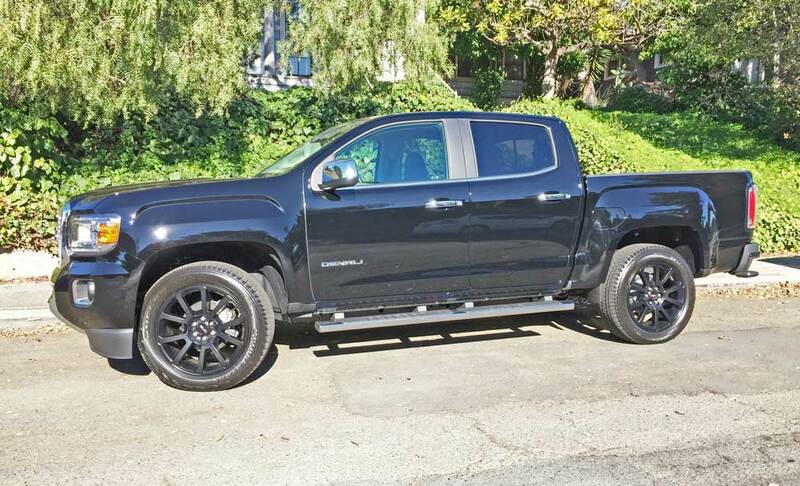 This latest midsize GMC Canyon 4WD Crew Cab in Denali trim offers the ideal alternative for consumers who don’t need or want a full size truck, and it actually drives, handles and feels more like a family sedan, while delivering added versatility and functionality. The 3.6-liter V-6 delivers more than adequate acceleration, with the handling characteristics, as already mentioned, more car than truck like, as was the ride comfort level. The transmission changes gears smoothly and efficiently and can easily handle towing up to 7,700 pounds. 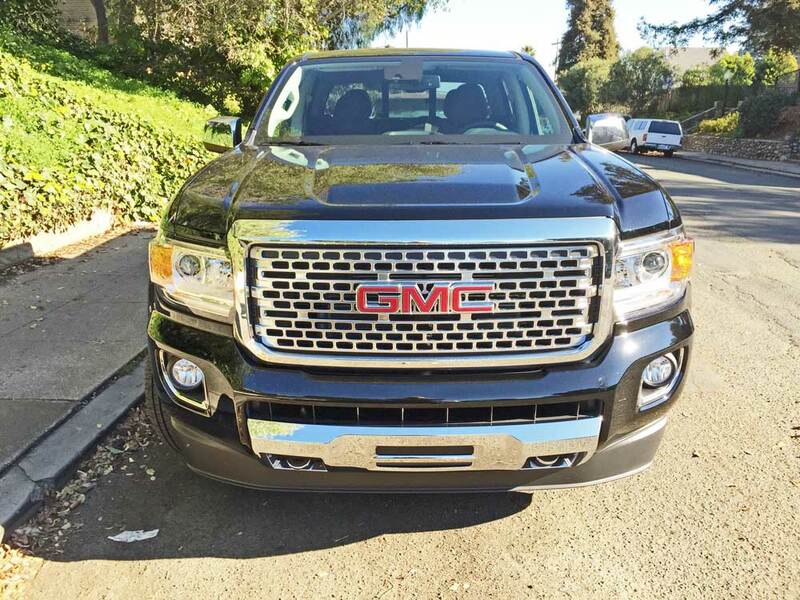 A host of accessories are available to tailor one’s GMC Canyon to suit their personal needs and lifestyles. 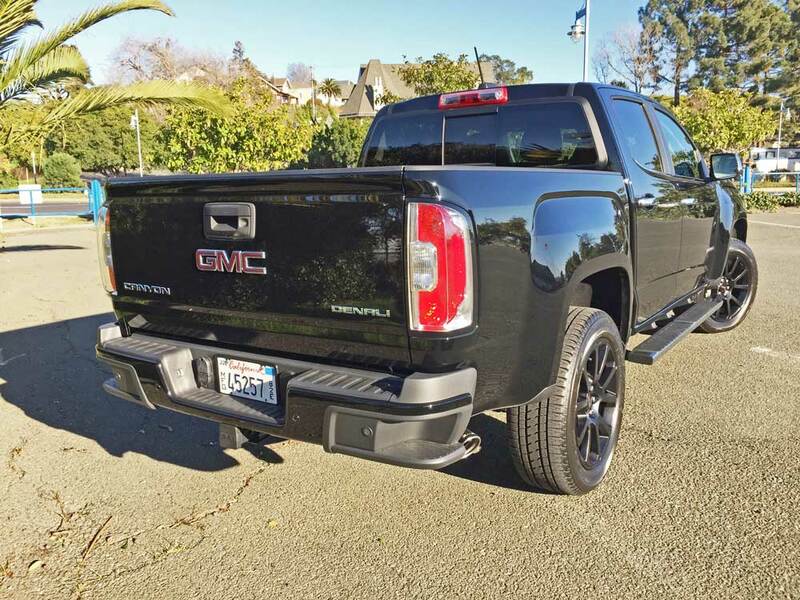 In the final analysis, if you are limited to owning only one vehicle, the 2015 GMC Canyon is capable of satisfactorily fulfilling a variety of roles from getting groceries to towing a trailer, with work duties and recreation thrown in for good measure. It is a handsome, fuel efficient, practical and affordable hauler. Satisfy your budget by picking the body style, powertrain, drive configuration, options and color that best meets your wants and needs. Engine Type and Size: 3.6-liter, DOHC, 24-valve V-6 with direct injection and VVT. Transmission: 8-speed automatic with Tow/Haul mode and powertrain grade braking. Drive Train: Longitudinally mounted front engine / 4WD with two-speed electric transfer case and fully automatic locking rear differential. Suspension: Front – Independent coil-over twin-tube shock absorbers. Rear – Solid axle with semi-elliptic two-stage multi-leaf springs; twin-tube shocks; G80 automatic-locking axle. Brakes: Power-assisted four-wheel disc brakes with Duralife long-life brake rotors; standard ABS, hill descent control available. 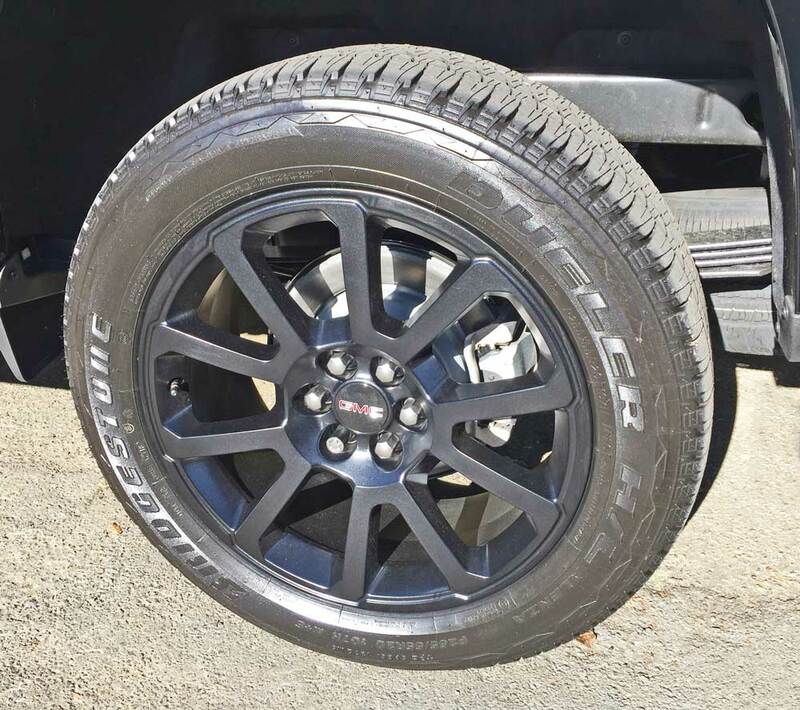 Tires: Bridgestone Dueler H/L Acenza P255/55 R20 107H M&S mounted on 5-“V”-spoke black alloy wheels.